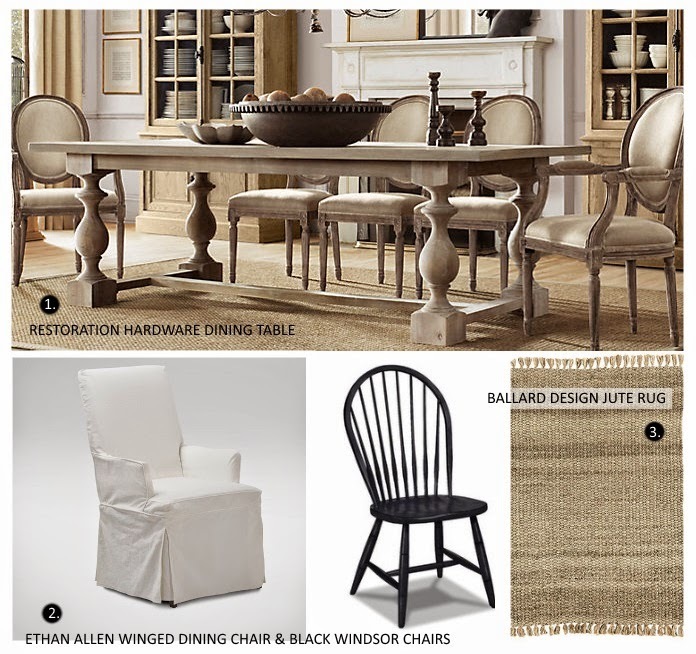 I started playing around earlier this month with ideas for the dining room. To me, it was the largest room that NEEDED a key design. The kitchen is designed to be stress free, with minimal extra precision needed and our family room I will be using all pre-existing furniture. Before we moved to Texas, I sold me beloved pottery-barn styled dining room table, and although it was a good decision, I have been stuck on ideas ever since. I just kept putting off even thinking about the dining room and just kept thinking, "I'll know when I see it." It once again proved to be right. I first started looking at shades of dining tables. Do I go really dark, medium or how about the really light colored tables that are really popular now. What is a safe buy and what will be a "chance". Or better yet, what will I still like in 10+ years ... do I have to be married to the look for the rest of my life?! I know - I get very stressed out like this is the only table I will ever have. To me, dark and very light were chances, but I REALLY liked them both. My last dining room table was a "safe" color that would look good from year to year. SO, I thought, I will just find a table online and then DIY it to look the way I want, save some money and then when I find the table of my dreams, I'll pick it up. So the hunt began. I found a lot of tables that I was satisfied with, however, nothing was pulling at my coat strings. With all the other projects I need to get done before the house is complete, will this send me over the edge? Enter ---- Restoration Hardware. I usually go into this store to just browse and get ideas. Never to really buy unless it's on sale or very small. Tiny budget here :) BUT, on this very day, a table that I loved was 75% off ........ ummm WHAT?! It actually made the table LESS than was I was going to pay, for something I was just getting by with. Hold up - the chairs? The chairs were priced less than the ones I found at IKEA ... holy cow, I need to jump on this table, spread out like I'm making a snow angle and hug the life out of it until Hubs can get here. Are you picturing this?! This is basically what I did. The sweet, sweet man behind the table let me know it was just a show piece and that it wasn't going home with me today :) Oops blush - newbie in isle 9 at RH!!! Hopefully I didn't drawl too much attention. Since the chairs weren't exactly what I wanted, we ended up just purchasing the table and soon, I was on another mission to find the perfect chairs. [I had a vision!] Enter Ethan Allen. I walked inside and THERE, right by the front door was my look. Almost exactly. Except for the black chairs, I wanted a Windsor Chair to make it a little more Farmhouse. So NOW, I have the look. Complete with the jute rug I found at Ballard Designs. I'm telling you - I feel SO great about putting all the pieces together in my home when it's complete. I chose a LIGHT table, which is taking a huge leap of faith for me, but seeing this all put together in EA, I know I made the right call. I still need to add drapes, but I believe I will be making these myself. What does your dining room look like?